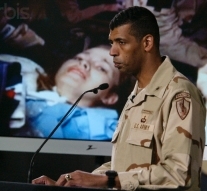 Pentagon's Story Almost Entirely Fictitious - Subsequent interviews with Iraqi hospital staffers and nearby residents show that almost every aspect of the Pentagon’s story is fabrication (see May 4, 2003, May 23, 2003, May 25, 2003, and June 17, 2003). Army Private Jessica Lynch, rescued from an Iraqi hospital by US Special Operations forces (see April 1, 2003), arrives at a US military hospital in Landestul, Germany. Military officials describe her as in “stable” condition, with multiple broken limbs and multiple gunshot and stab wounds. Pentagon spokeswoman Victoria Clarke tells reporters that Lynch is “in good spirits and being treated for injuries.” Another military officer tells reporters that she is conscious and was able to communicate with her rescuers, but “she was pretty messed up.” Lynch has spoken with her parents by telephone, who describe her as in good spirits, but hungry and in pain. [Washington Post, 4/3/2003] The New York Times reports that Lynch suffered from gunshot wounds: “Details of what happened to Private Lynch were scarce. An Army official said Tuesday night that Private Lynch had been shot multiple times. The official said that it had not been determined whether she was shot during the rescue attempt or before it.” The Associated Press reports, “Officials who spoke on condition of anonymity said she was suffering from broken legs, a broken arm, and at least one gunshot wound.” [Project for Excellence in Journalism, 6/23/2003] It is later determined that Lynch was not, in fact, shot (see April 15, 2003). 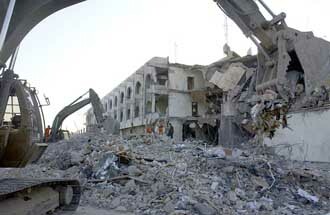 Destruction after the bombing of the UN building in Baghdad. [Source: US Army]In the summer of 2003, Islamist militant leader Abu Musab al-Zarqawi moves his operations to the Sunni areas of Iraq. Soon he is linked to a number of bombings of civilians. On August 7, his group al-Tawhid allegedly car bombs the Jordanian embassy in Baghdad, killing 17 people and wounding more than 60. On August 19, a car bomb hits United Nations headquarters in Baghdad, killing 24 people and wounding more than 100. UN envoy Sergio Vieira de Mello is one of those killed. A former Jordanian intelligence official who studied al-Zarqawi for a decade will say in 2006 of this time period, “Even then—and even more so now—al-Zarqawi was not the main force in the insurgency. To establish himself, he carried out the Muhammad al-Hakim operation, and the attack against the UN. Both of them gained a lot of support for him—with the tribes, with Saddam’s army and other remnants of his regime. They made al-Zarqawi the symbol of the resistance in Iraq, but not the leader. And he never has been.” [Atlantic Monthly, 6/8/2006] Over the next several years, the US government blames nearly every major bombing of civilians in Iraq on al-Zarqawi. For instance, an MSNBC article in early 2005 lists 35 attacks attributed to him. 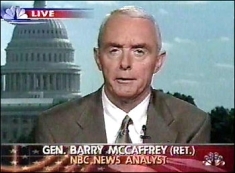 [MSNBC, 5/4/2005] But there is rarely any evidence definitively determining who was behind any given attack, and arrests or prosecutions of the bombers or their associates are even rarer. In late 2004, a Daily Telegraph article will claim that several US military intelligence sources complain that the importance of al-Zarqawi “has been exaggerated by flawed intelligence and the Bush administration’s desire to find ‘a villain’ for the post-invasion mayhem. US military intelligence agents in Iraq have revealed a series of botched and often tawdry dealings with unreliable sources who, in the words of one source, ‘told us what we wanted to hear.… We were basically paying up to $10,000 a time to opportunists, criminals, and chancers who passed off fiction and supposition about al-Zarqawi as cast-iron fact, making him out as the linchpin of just about every attack in Iraq’” (see October 4, 2004). [Daily Telegraph, 10/4/2004] But despite this, the blaming of nearly all attacks on al-Zarqawi will continue. The Jordanian intelligence expert on al-Zarqawi will complain in 2006, “The Americans have been patently stupid in all of this. They’ve blown Zarqawi so out of proportion that, of course, his prestige has grown. And as a result, sleeper cells from all over Europe are coming to join him now.… Your government is creating a self-fulfilling prophecy.” [Atlantic Monthly, 6/8/2006] In April 2006, the Washington Post will report that the US military has been deliberately exaggerating the importance of al-Zarqawi in order to link the war in Iraq to al-Qaeda for the US public, due to al-Zarqawi’s alleged al-Qaeda ties (see April 10, 2006). 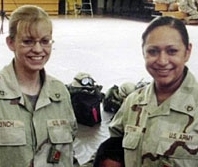 Defense Department spokesman Lieutenant Colonel James Casella confirms that, contrary to previous reports (see April 1, 2003 and April 3, 2003), rescued POW Jessica Lynch was neither shot nor stabbed (see May 4, 2003 and June 17, 2003). “She wasn’t stabbed,” Casella says. “She wasn’t shot and she has some broken bones.” Walter Reed Army Medical Center, where Lynch is currently undergoing treatment, says only that Lynch has had surgery to repair a broken foot and otherwise “remains in satisfactory condition, undergoing occupational and physical therapy.” [New York Times, 6/13/2003] It is not explained why it took so long to confirm this. During the week marking the 48th anniversary of the bombing of Hiroshima and Nagasaki, 150 people attend a secret conference at Offutt Air Force Base in Nebraska to discuss plans to develop a new generation of nuclear weapons, including the so-called “mini-nukes” and “bunker busters,” that could be used against rogue states and terrorist organizations. The B-29 planes that dropped the atomic bombs on the two Japanese cities, Enola Gay and Bock’s Car, were both built at Offutt. 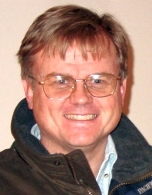 Another topic to be discussed is whether the development of nuclear weapons would require a repeal of the 1992 “Spratt-Furse restriction,” which banned such weapons. Though the exact identities of the attendees are not known, unnamed sources tell the Guardian of London that the meeting is attended by scientists and administrators from the three main nuclear weapons laboratories, Los Alamos, Sandia and Livermore; senior officers from the air force and strategic command; weapons contractors; and civilian defense officials. No representatives from Congress, however, are at the meeting. According to the Guardian, “Requests by Congress to send observers were rejected, and an oversight committee which included academic nuclear experts was disbanded only a few weeks earlier.” One congressional weapons expert tells the London newspaper, “I was specifically told I couldn’t come.” [Guardian, 8/7/2003] According to the January meeting that had planned for this event (see January 10, 2003), other issues to be addressed include the possible recommencement of nuclear testing and how to convince the American public the new nuclear weapons are necessary. A military photo of a flag-draped casket. 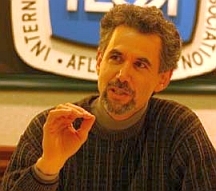 [Source: The Memory Hole]Russ Kick, an author and owner of “The Memory Hole,” a Web site dedicated to presenting information it thinks the government does not want revealed, receives a CD from the US military containing 361 photographs of flag-draped coffins returning to the US from overseas postings—mostly Iraq—through Dover Air Force Base. Kick had filed a Freedom of Information Act (FOIA) request in October 2003 for photos of coffins at the base, had been rejected, and had appealed. He is surprised to actually receive the photos. None of the photos contain personally identifying information, and most depict row after row of coffins strapped down in the holds of transport planes. 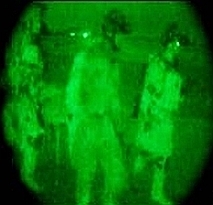 Kick immediately posts the photographs on his Web site, writing, “Score one for freedom of information and the public’s right to know.” The Bush administration immediately orders the Pentagon to conceal such photographs in the future, citing the soldiers’ families’ right to privacy, even though the photographs reveal no personal information about the soldiers. Representative Jim McDermott (D-WA), a former Navy officer, says: “This is not about privacy. 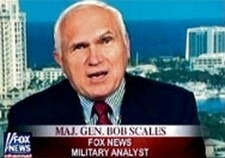 This is about trying to keep the country from facing the reality of war.” [Russ Kick, 4/2004; Savage, 2007, pp. 105-106] In 2004, a contractor will be fired for releasing a photo of flag-draped coffins to the press (see April 18, 2004 and After). 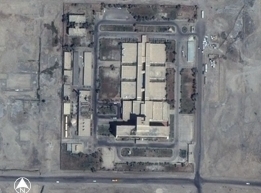 In 2009, the Obama administration will reverse the Pentagon policy and allow photographs to be published (see February 26, 2009). 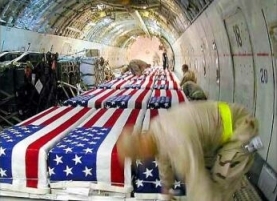 One of Tami Silicio’s photos of flag-draped coffins on a transport plane in Kuwait. [Source: Tami Silicio / Seattle Times]The Seattle Times publishes several photographs of flag-draped coffins bearing US troops killed in Iraq. The Times is the first newspaper to defy the Pentagon’s ban on such photos appearing in the news media. The photos were taken on April 7 by Tami Silicio, a contract cargo loader for Maytag Aircraft. The photos show caskets being loaded onto a transport plane in Kuwait. “The way everyone salutes with such emotion and intensity and respect,” she says in the Times article accompanying the photo. “The families would be proud to see their sons and daughters saluted like that.… So far this month, almost every night we send them home.… It’s tough. Very tough.” The photo publication provokes a round of criticism from White House officials, who claim the ban is to protect the sensibilities of the families of the fallen, as well as supportive statements from, among others, Democratic presidential candidate John Kerry.